When building a birdhouse or nestbox, the hole size (entrance) is one of the most important decisions you will need to make. Do you know that the diameter of the hole determines which birds will fit into the house and which birds will leave it alone? If the entrance hole is too large you might find less desirable birds are using your birdhouse. If you are not sure which types of birds you want to attract, go with a larger hole size. This is because birds in general will use a bird house with an entrance hole larger than required. However, the birds will be at more risk from predators such as European starlings which are known for killing nestlings. 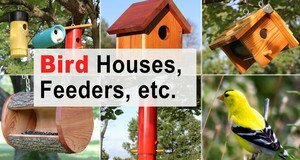 Learn about the best locations for birdhouse placement. Below are some optimum hole sizes for common cavity nesting birds. That is, birds that build nests and lay eggs inside a cavity or sheltered chamber. 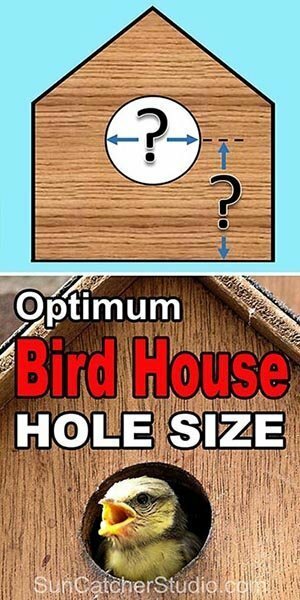 Optimum Birdhouse Hole Size for Cavity Nesting Birds. *Entrance Height – location of hole above floor. Where to mount the birdhouse. To attract nesting birds, it is important to mount or hang the birdhouse in the ideal location. Below are some factors to consider when deciding on where to place a birdhouse. Purple martins and bluebirds prefer birdhouses that are in open areas. Most other birds prefer concealed areas that help camouflage the birdhouse. The parents like branches nearby so they can keep an eye over their family. In general, the higher the bird house the more protection the house provides from cats and other predators. The chart above list the recommended heights for mounting birdhouses for various bird species. Bird House and Bird Feeder Plans. Thank you, just the information I was looking for. What size opening and mounting height for a cardinal? The swallows are pretty but they chase all the other birds away. Last year I had a pair of sparrows and robins nesting in our houses but after the swallows appeared and bothered them the other birds cleaned out the houses and left. I wanted to build and donate to our local walking trail 10 bird houses I want to do it the most cheapest way but safest for the birds what wood do I use and do I put a water protectant on it as well?? If that project goes well I would like to build more for other area’s. Can anyone help with my question? I would check out the video on the page Blue Bird Nest Boxes if you are looking for inexpensive birdhouses. What type of birdhouse would be suitable for the Eastern Phoebe that would also protect them from Blue Jays? We have several that build under the eaves of our outbuildings, but the Blue Jays have raided several broods.